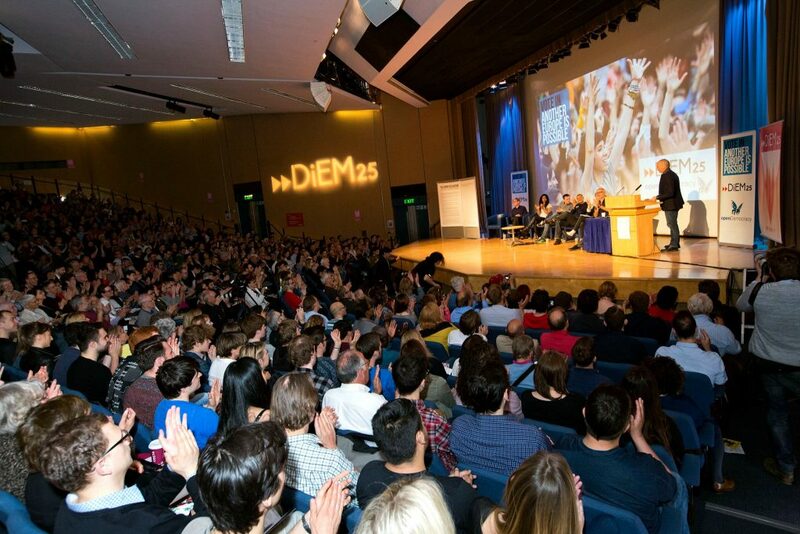 Varoufakis, the former Greek Finance minister and radical leader of DiEM25 a grass roots movement to democratise the EU, urged progressive members of the Remain campaign, to confront the complete “failure of progressive forces to harness the anti-establishment rage”. And its true, from the outset, we struggled to find a voice that resonated beyond our own echo chambers. Complex nuanced arguments never crystallised into potent rhetoric or cogent images. The language was too technocratic, sounding like so many unwanted memos from the -expertocracy- Nothing in our rhetorical armoury could match Take Back Control or – Our Independence Day-. The challenge across Europe will be to better understand the appeal of these slogans do we stand a chance of matching it. Serious hard thinking must be matched by communications that can function in the -social media vortex-. The trouble is that outside of radical circles (including radical neo-liberals) practically no one believes in a Trans-national vision of Europe. It is tarnished as an autocratic federalist -superstate- How can DiEM (and others committed to -another Europe-) contest the perception that more Europe must mean less democracy? Certainly without a profound (almost revolutionary) deepening of European democracy the EU project and the Union, it is doomed to remain the world’s most successful Hayekian social dictatorship, in which the market is forever separated from politics . For Streeck, Habermas’s approach is in its own way profoundly technocratic with its faith in constitutionalism. For Streeck there is failure to recognise that capitalism is not just a mechanistic system but a space populated by real interests with real agency who will protect its privileges at all costs. This is a real danger, and a hangover from the aspect of the Frankfurt School whose crisis theory of capitalism on the basis of economics to resistance in the cultural sphere. The question is does DiEM and Varoufakis offer a model that is better aligned to current political realities ? If so I haven’t yet seen it. At the heart of Streeck’s opposition (and the most tangible differentiation with Habermas) is his hostility to the Euro “a frivolous experiment (Polyanyi) following which follows prescriptions of standard economics is to reshape a highly heterogeneous transnational society into a market society, with no regard for diverse structures, institutions and traditions… He sees it as the modern equivalent of the Gold standard and argues that abandoning it would release energies as valuable as those released when the Gold standard was dropped. 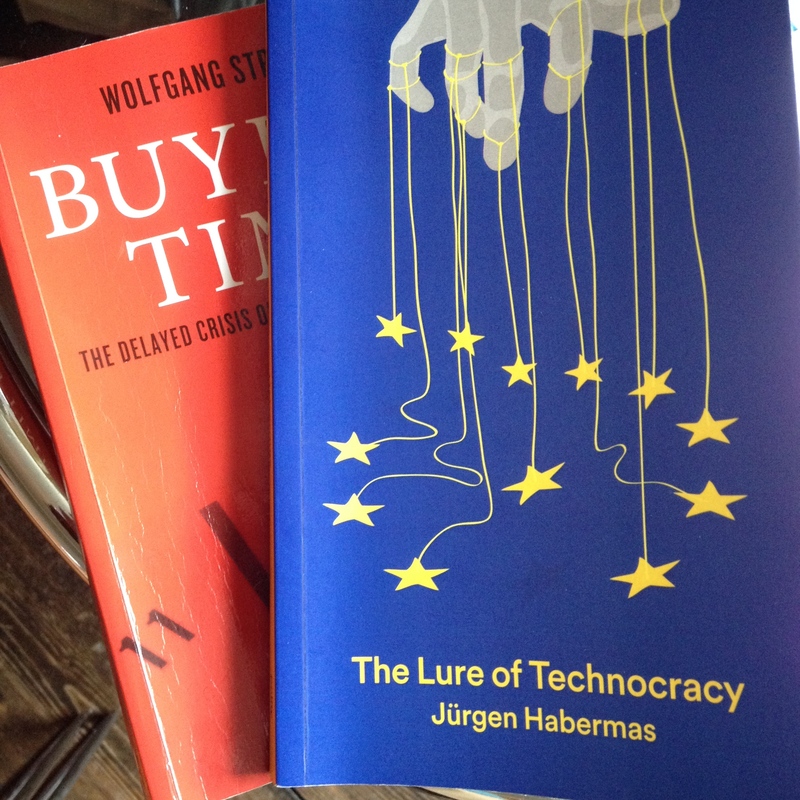 The difference between Habermas and Streeck is not ideological but strategic, empiricle and practical. For Streeck, Hayekien neo-liberalism is simply too strong, too embedded to be reversed at this stage. Unlike its Hayekian rival, the movements seeking to democratise Europe at this stage would be swimming against the historical tide…. -The huge Hayekian lead means that implementing the Utopian model appears completely unrealistic. The fact that the neo-liberal project was a long game played over generations should be a reason enough to avoid Streeck’s defeatist conclusions. Even a long journey must begin somewhere. And from the off shore Island where I am reluctantly sitting now seems like a good time to join my Contiental frends in fighting to deepen European democracy and open up the boarders. as Brexit proceeds (poor us!). is a project of many generations. This is not the bogyman of a -Federal Superstate- its a Europe in which we are able to be both European citizens and citizens of our individual member states. If this sounds artificial we must remember that -the nation state also began as a highly artificial form of solidarity among strangers based on legal and constitutional arrangements. The fact that we deal with artifice should remind us that the deep flaws in the EU to which Streeck points are NOT a state of nature. We must understand that the painful detailed work of both opposition and re-design must mean holding fast to the idea that democracy must mean above all that social justice stops being reduced to market justice.